In dealing with antiquities, one tends to focus on objects truly “ancient” in that they belong to cultures such as Mesopotamia, Egypt, Greece, Rome. Defining precisely what is ancient or an antiquity is itself something of a puzzle, with scholars, dealers, curators and collectors all having varying opinions. Clio Ancient Art has defined any object made prior to the year 1500 AD as an antiquity. This allows art and artifacts from the later Byzantine Empire, Medieval Europe (or at least Europe prior to the full flowering of the Renaissance) and Medieval Islam to be included. Great Britain is fortunate to be among those societies that live every day with the physical evidence of a continuum of culture all around them. Most English museums, even in small communities, have excellent collections of the art and artifacts of every day life, ranging from the stone age to the industrial era, including the loosely defined “Middle Ages” – In England, the period beginning with the Roman departure from Britain and ending with the rise of the Tudor Dynasty. Those living in London are especially fortunate in having two spectacular collections of Medieval antiquities to visit: The British Museum and the Museum of London. This photo essay examines a few personal favorites from among countless marvelous objects dating to this broad period of time. All photos should be credited to Clio Ancient Art and Antiquities. A Saxon silver gilt brooch and gold shield bosses, all dated to around 600 AD and found in the greater London area. Behind them, an early hand made Saxon pottery vessel. Museum of London. A brooch made of copper decorated with gold plates, gold wire and polished garnets. 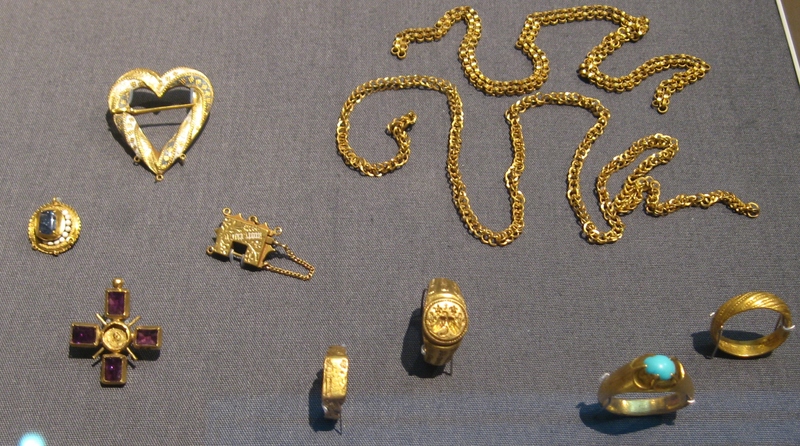 Dated to about 650 AD, it belonged to a wealthy Saxon woman who was buried in what is now Covent Garden with beads, rings and other personal items. Museum of London. 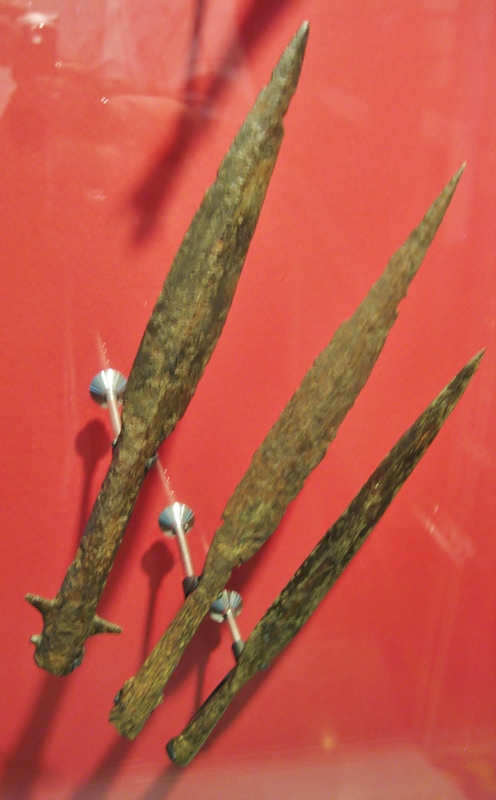 Viking bronze spearheads found in the Thames and dating to the 700s and 800s AD. Museum of London. A grave marker dated to shortly after 1000 AD, found near St Paul Cathedral in 1852. 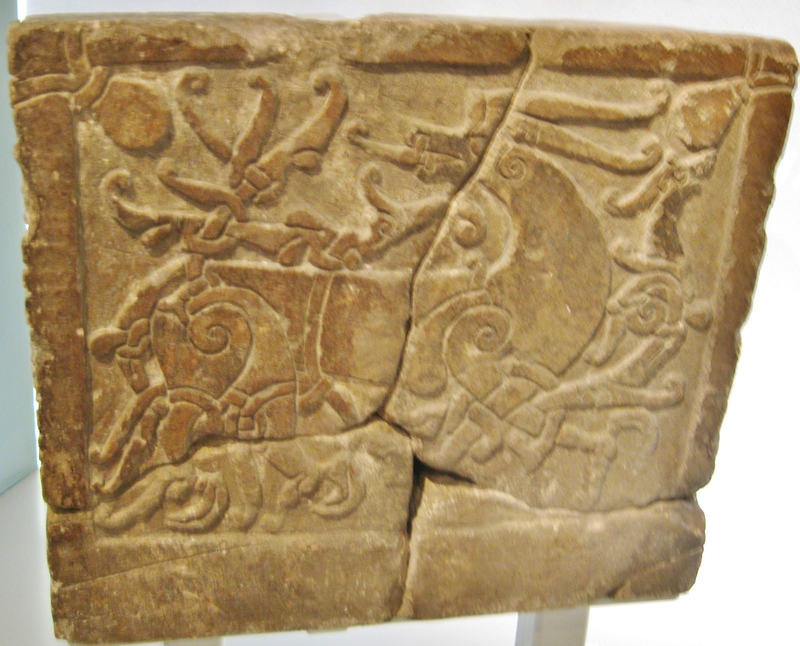 The style is Anglo-Norse and was popular in both Scandinavia and late Saxon England. It depicts a stylized lion in combat with a serpent. Museum of London. 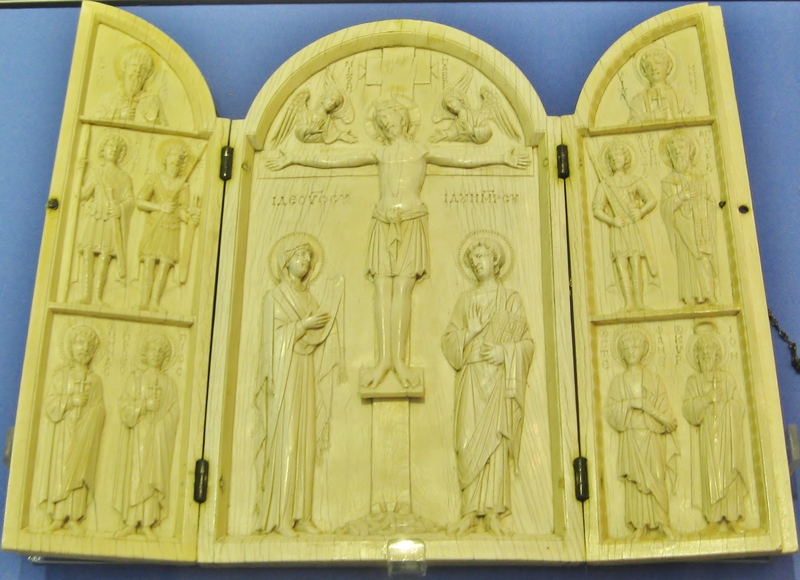 Known as the Borradaile Triptych, this magnificent work of ivory was created between 900 and 1000 AD in Constantinople (today known as Istanbul), capital of the Byzantine Empire, and made its way to a convent in France at some time in the Middle Ages. The British Museum. 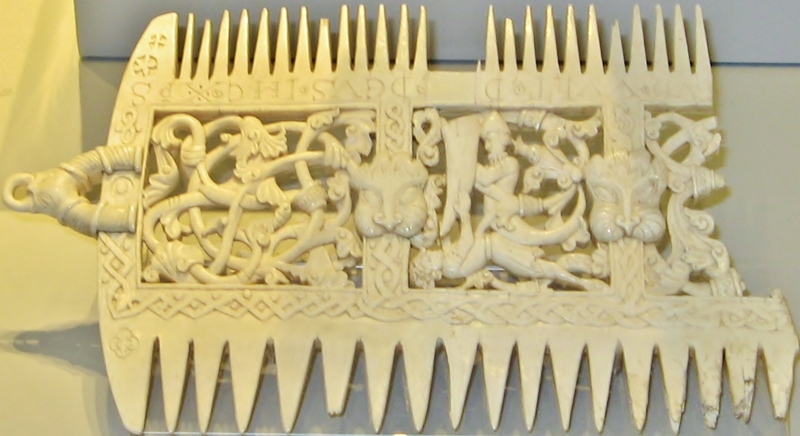 An otherwise indecipherable Latin inscription on this comb of elephant ivory, an exotic material, contains the word “God” suggesting it was made for religious ceremonies. It dates to between 1080 and 1100 AD. At this time in England, combs were used to groom the priest prior to consecration of the bread and wine to avoid their being contaminated. The British Museum. Fine glass imported from distant lands was no doubt an expensive commodity in Medieval London. The green Islamic glass vessel at left dates to around the 10th Century. The two finely enameled Islamic glass shards at bottom center were made in Egypt or Syria in the 13th or 14th Century. The enameled glass at far right was made in Venice around 1300 AD. Museum of London. 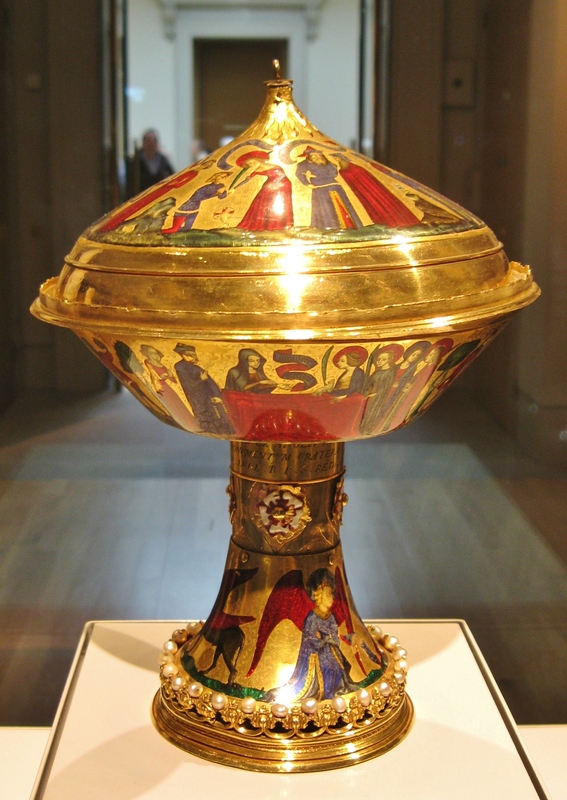 This remarkable enameled gold cup was commissioned by Jean Duc de Berry for his nephew Charles VI of France in 1391. The wars between England and France saw it pass to the English royal household in 1435. During Henry VIII’s reign Tudor roses were added to the stem. James I gave it to the Spanish ambassador in 1604 to mark a peace treaty and it was gifted to a Spanish convent in 1610, where it remained until appearing on the Paris art market in 1883. Wealthy private homes, churches and key public buildings often had floors covered in decorated ceramic tiles. 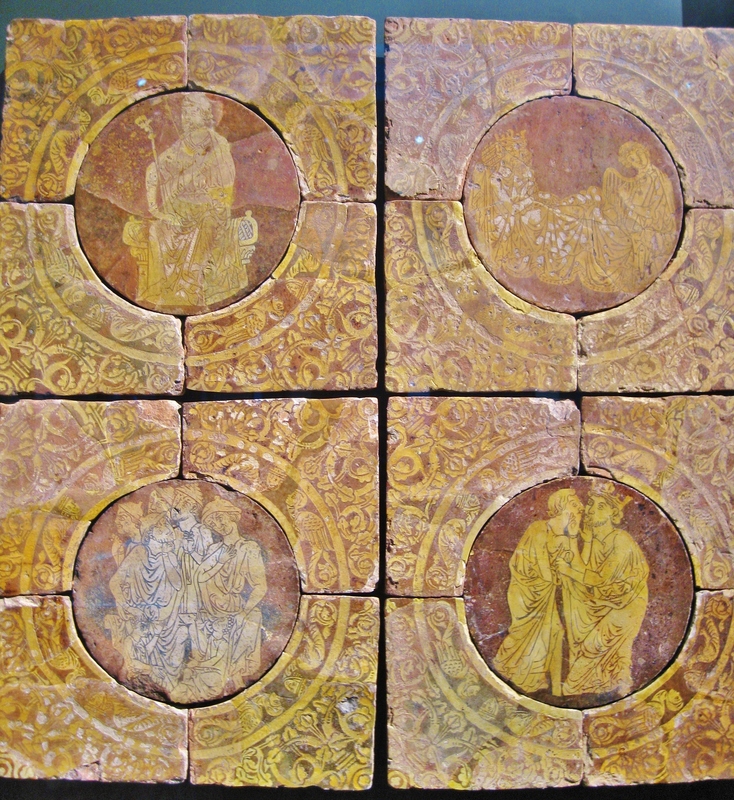 The tile making industry flourished during the 13th, 14th and early 15th Century. This group of tiles tells the beginning of the popular story of the adulterous love affair between Tristram and Isolde. The full story sequence would have included over 30 of these groups of tiles. They were probably commissioned for an important private residence. Late 13th Century. The British Museum. 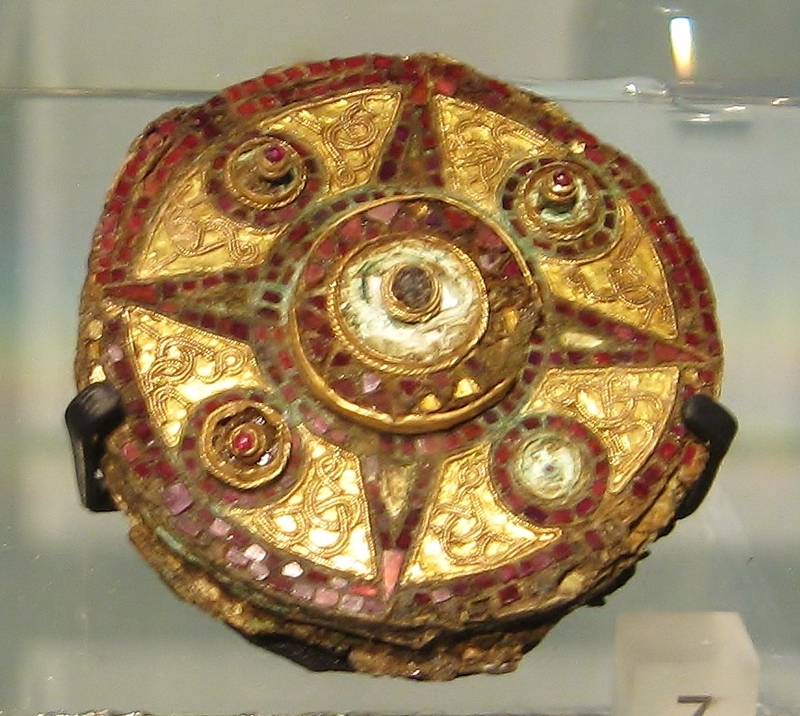 This brooch was made in either England or France around 1400 AD. 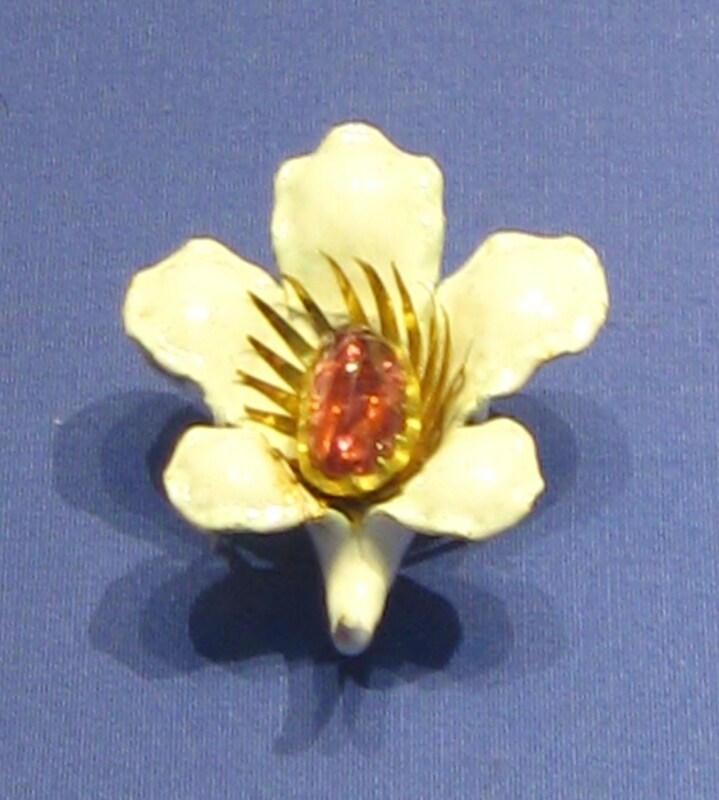 It features white enamel with a pink tourmaline, a stone that would have been rare at the time and probably came from Sri Lanka. Henry of Lancaster, later King Henry IV of England, is known to have given this type of white enamel jewelery to his friends. The British Museum, on loan from All Souls College, Oxford University. Above and Below: The Fishpool Hoard of gold coins and jewelery, buried around 1464, based on the latest coins in the hoard. 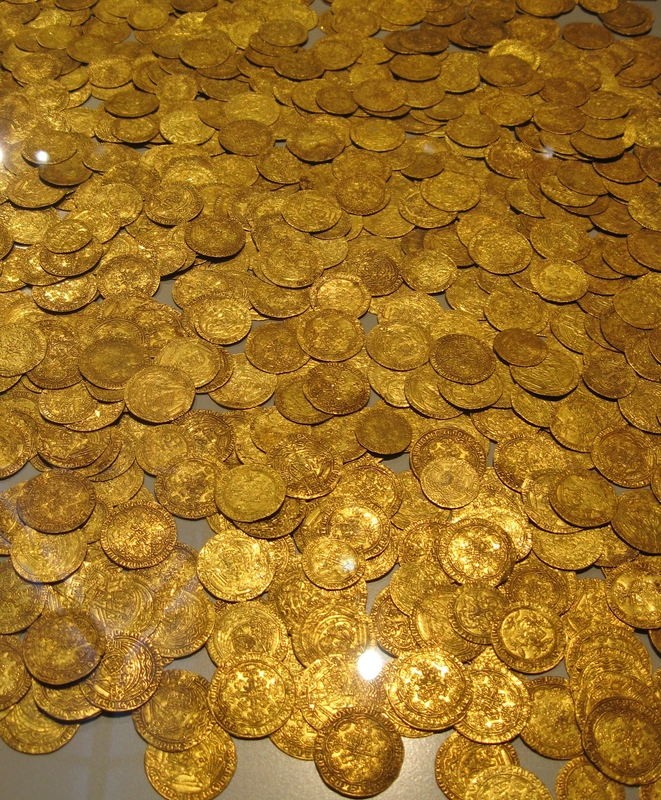 It consists of nearly 1,300 gold coins and many pieces of fine jewelery. It seems to have been buried by a Lancastrian sympathizer fleeing the Battle of Hexham (during the Wars of the Roses), as the Lancastrians were defeated by the Yorkists there.